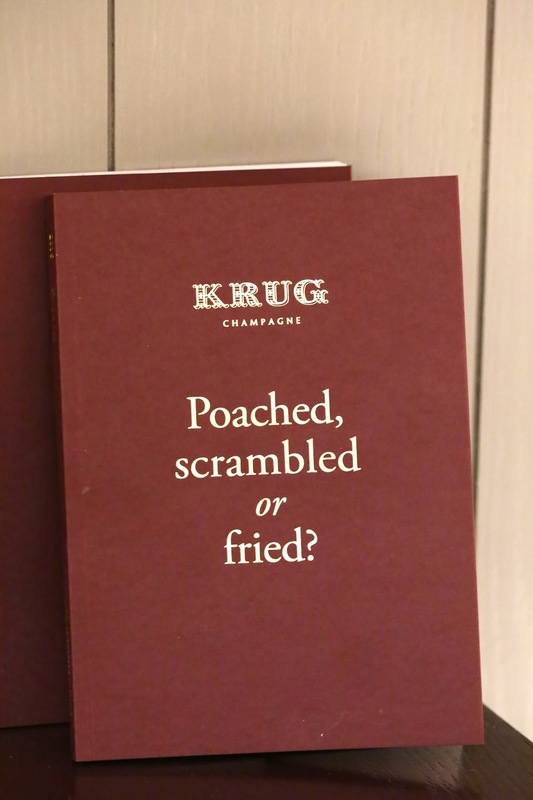 Tonight I was privileged to have been invited to attend the local launch event for Krug x Egg - a collaboration between Champagne Krug and chefs around the world who have created egg dishes to pair with the Champagne house's signature Grande Cuvée. The recipes have been collated and published as a beautiful cookbook, similar to previous volumes on potatoes, tomatoes, and crabs. Locally in Hong Kong, 14 restaurants have signed up to present dishes that will be paired with the Champagne - and these will be offered starting on the first of July. Three of these restaurants sent teams to the House of Madison tonight to present their offerings at the preview. We started with, of course, flutes of Krug Grande Cuvée. Tonight these were served from magnums, and this batch used 2005 as the base wine. Lots of toasty corn in the nose, while it was lovely and mature on the palate. Egg / chicken / corn, from Restaurant Akrame - the egg was steamed at 63°C and covered with a very thin sheet of Mimolette. Below the egg were cubes of poached chicken with shallots, which I found slightly overcooked. The team then sprinkled some popcorn on top. This was pretty tasty, and I thought the popcorn was a stroke of genius... because the nose of Krug Grande Cuvée is always full of toasty corn. Smoked egg and asparagus with truffle, Parmesan and hazelnut dressing, from Aberdeen Street Social - very nicely balanced. The acidity from the asparagus vinaigrette cuts through the richness of the yolk and the Parmesan foam. It also enhanced the acidity in the Champagne. Smoked egg, mushroom, and truffle, from Catalunya - a syringe is inserted into a soft-boiled yolk to extract part of the contents, then truffle broth is injected back into the yolk sac. This is then smoked inside a glass dome, before potato foam is squirted on top. This is pretty much how the truffled egg is done by Eneko Atxa at Azurmendi, except here you've got some bits of mushrooms at the bottom and potato foam on top. 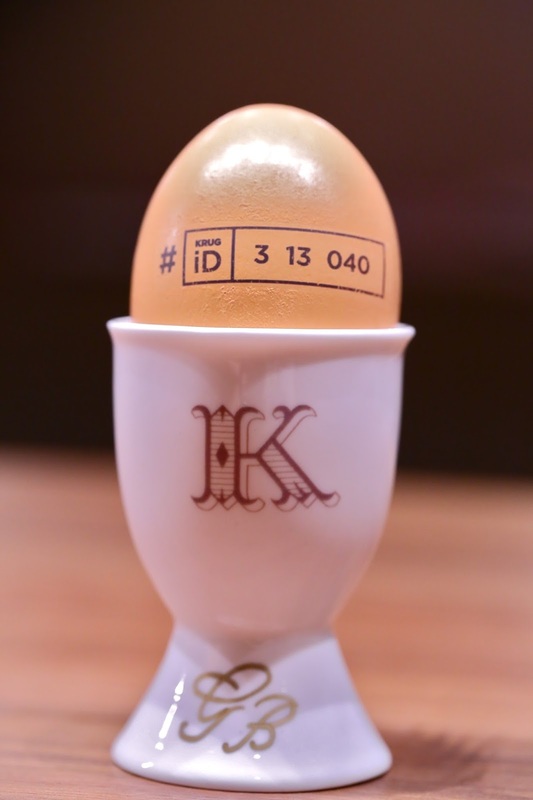 At the end of the evening, each of us received an egg stand personalized with our initials, meticulously decorated by Gigi Tang from Steady Hands Creative. Such a nice souvenir! A pretty interesting evening, and I really look forward to visiting a few more restaurants for their special egg dishes.